A very tough slide to make as carving cow horn is very hard. First step was to cut the bonnet and expand the horn. The original article called for the horn to be boiled until the it was pliable. I found it really didn't work well and then found a different method. I soaked the cow horn in ammonia for a week. 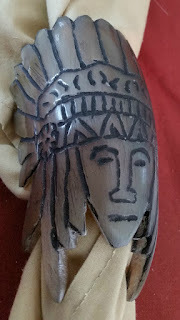 After shaping the horn it was on to the carving with a linoleum blade. Then I rubbed black shoe polish into the crevices then finished it off with a polishing rag.